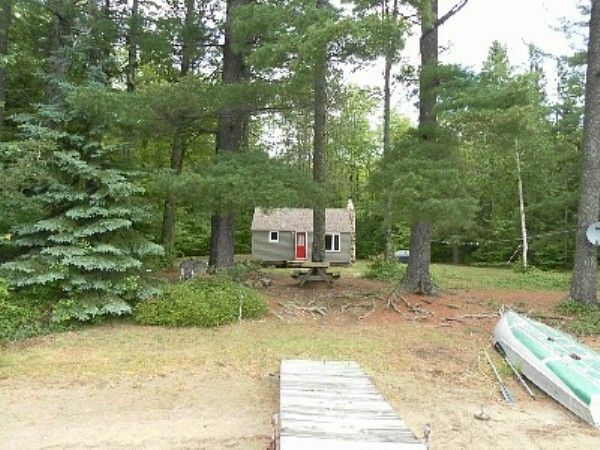 Rustic Cottage on lake Swim,Fish,boat,Fireplace,Pictured Rocks! Rainbow's Promise is the newest addition to our vacation home family. Located on beautiful Townline Lake with 200 feet of shoreline and three acres of property. Rainbow's Promise is located within the Hiawatha National Forest, close to Pictured Rocks National Lakeshore, and Munising, MI. This 840 square foot cottage has 1 bedroom with a double size bed, a 'ladder loft' with two twin size beds, a log style couch that folds into a double sleeper, and a bathroom with shower on the main floor. We have a full kitchen with dining table and extra space at the counter. A wood buring fireplace to warm the cottage on cool nights in the forest. Townline Lake is a 'no wake' lake so a row boat with paddles and life preservers are provided so you can explore the 40 acres of water or dip your line for a chance at pike, bluegill, bass or perch. Bring your catch back to the dock and cook on the charcoal grill or over the large stone fire pit, wood included. Further Details: Gaze into the light of the outdoor fire or sip a cool drink while lounging on the dock listening to the area birds and wildlife. You'll find Rainbow's Promise to be peaceful and serene and a place where you can get away from it all. Bruno's Run hiking trail is adjacent to the property and offers 9 miles of hiking or biking opportunities. Beautiful view of the lake with a firepit near the lake for picturesque views. Pretty lake, sandy bottom, good for swimming and fishing! landline phone for local calls. wood burning, ask about firewood. There is a table and counter seating. You are welcome to bring your own or rent one from nearby. biking and hiking trails within walking distance. Fishing boat is included. The lake is nice and sandy by shore for swimming and there are some nice pan fish in the lake. cement patio just outside sliding doors. Pictured Rocks Golf & County Club in nearby Munising. This cottage is a perfect place for a couple to honeymoon or a fun family getaway. There are other homes on the lake, however this spot is nicely secluded from other homes. Extremely clean and well appointed, the cabin was a perfect getaway into the UP and not far from Munising. The lake was very clean and good swimming. Had a great time at Rainbows Promise cottage. It was the perfect size for our family. Everything we needed was at the cottage. The location was quite and peaceful. Close to trails, Pictured Rocks and waterfalls galore. Great cabin, huge fire pit, very well decorated. Owners were great to work with thru the whole process. We have stayed at Rainbows Promise for several years. Each year we are surprised with the updates made... this year it was the new flooring and larger bathroom design. The location to things we want to do is ideal and the changes to Munising are exciting. The property has always been well-maintained and the cottage is well stocked with the basic needs of a family on vacation. Fantastic. Beautiful. The ultimate in peace. This was our third time at Rainbow's Promise and each year it just gets better. We loved the new flooring and remodeled bathroom this year. The quiet and tranquility are just so healing and nurturing. The cottage is just immaculate and everything is made so comfortable and easy. A PERFECT place. Our stay at Rainbow’s Promise was terrific! We really liked the cottage and the view to the lake out front was splendid to wake up to every morning. Townline Lake’s water was crystal clear and very inviting (though too cold to swim in early October, ha!). We loved using the trails close by and we were close enough to Pictured Rocks National Lakeshore to spend time hiking and at the recreation areas there. The cottage was clean and well kept, with a fully functional kitchen for cooking any meals we needed. It was nice having a full-size fridge for plenty of food for our stay. Hopefully we can come back for another stay in the beautiful UP at Rainbow’s Promise. This is a beautiful area in the Hiawatha National Forest, hiking trail right out the door and a short drive to Munising/Pictured Rocks area! •	Summer Sat-Sat is preferred contact me via phone/text 906 202 2677 •	Min stay varies, please message me before you instant book to avoid a change to your dates •	Cancellation Policy: we will always work to re-rent your dates. •	Signed rental agreement and guest information is required •	Balance is due by check/U.S. mail OR add 5% convenience fee.